In honor of Rheumatoid Awareness Day, Crescendo Bioscience is offering a matching grant to the Rheumatoid Patient Foundation. 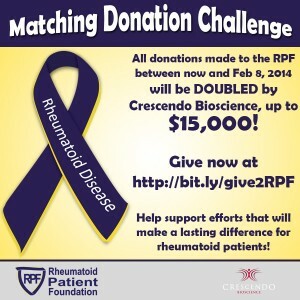 Now through February 8, 2014, all donations made to RPF will be doubled by Crescendo Bioscience – up to $15,000! Thanks to this generous matching grant, you have the opportunity to double your dollars and double your impact for RPF. Your donations are what make the RPF possible, and together we can make a difference in the lives of those with Rheumatoid Disease. Consider a gift as simple as $7 -- which will be doubled to $14 -- in celebration of the 2014 Rheumatoid Awareness Day. Click here for more ways you can get involved in Rheumatoid Awareness Day. Or maybe one dollar for every year that you or your loved one has lived with rheumatoid disease. ← What Is Rheumatoid Awareness Day?